If you’ve walked past our store recently then you may have noticed the Cake of the Month poster in our window. This is a very exciting deal that we’ve launched just in time for Christmas. Every month there will be a new design for the same great price. The deal is for an 8″ cake (up to 25 finger portions) which, once purchased, can be booked in for any time. So if you see a design in January that’s perfect for your nephew’s birthday in March, you can get it booked in for then! At just £40 this is a guaranteed saving of at least £10 – possibly more depending on the individual design! For the month of December we wanted to keep it seasonal but simple. 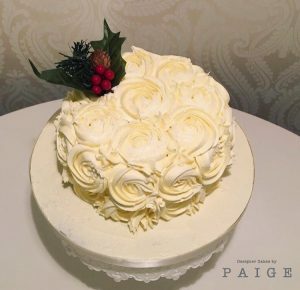 This lovely rose swirl buttercream cake features subtle edible glitter and a festive flower spray. As well as the launch of our Cake of the Month club we’ve also launched a range of festive treats in store available for purchase. We’ve got bags of cake truffles in classic chocolate, white chocolate and coconut and chocolate orange. We’ve also got a festive range of gourmet cupcakes and push pops and cake pops. With treats starting from £1.50 we’ve got something for everyone! 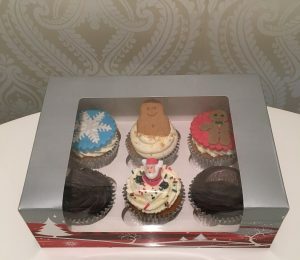 For an extra special Christmas treat, why not pick up a box of mixed festive cupcakes for £12. For full details on our festive goodies check them out here. Previous story Brand New Tasty Treats!